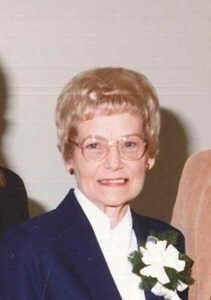 Dorothy L. Ramsey, 90, Topeka, passed away Wednesday, January 30, 2019. Dorothy was born February 16, 1928 in Topeka, the daughter of Vernon T. and Rose P. (Bateson) Grooms, Sr. She graduated from Topeka High School in 1945. She was employed by Hallmark Card for over 20 years, retiring in 1989. Dorothy married Thomas J “Bud” Ramsey in 1947 in Topeka. He died April 15, 1990. Survivors include son, Thomas (Emily) Ramsey, Auburn; granddaughter, Heather (Kevin) Hoffmans, Topeka; 5 great-grandchildren; and 1 great-great grandson. She was also preceded in death by a son, Timothy Ramsey; and grandson, Wade Ramsey. Funeral services will be held at 1:00 p.m. on Thursday, February 7, 2019 at Dove Southwest Chapel, 3700 SW Wanamaker Road. Burial will be in Mount Hope Cemetery. The family will receive friends at the funeral home one hour prior to the service. Memorial contributions may be made to Countryside United Methodist Church, 3221 SW Burlingame Road, Topeka, KS 66611. Add your memories to the guest book of Dorothy Ramsey. I thank God for blessing me with a grandmother who was always patient, loving and kind. She showed me how to be strong and graceful; take care of self and others, trust and love. Examine truth, find answers and forgiveness. I thank God for giving me the time to visit with her regularly, hold her hand, tell her how so very much I love her and pray that God comfort her in the surrender from this life to eternal peace. Dorothy was such a sweet lady and will be terribly missed. It's sad to think we won't be seeing her again, while at the same time thinking of the eternal joy of her being with her beloved son, Tim; grandson, Wade; and other loved ones. She was an angle to me. She loved her hole family , she was such a beautiful lady. No mader what she was going through when ever I saw her she always was so kind and had such a beautiful smile. Tom you was her pride and joy. Heather you was her little angel. God bless you all Love always Terri Cramer.